how to make it visible? Explorer "Folder Options": Mark "Show hidden files, folders and drives"
I also have another app in the works called K0ntr0l that has pattern management functionalities and is able to import (convert) ABL and Phoscyon pattern files. It is in the last stages of implementation and will also be released soon. 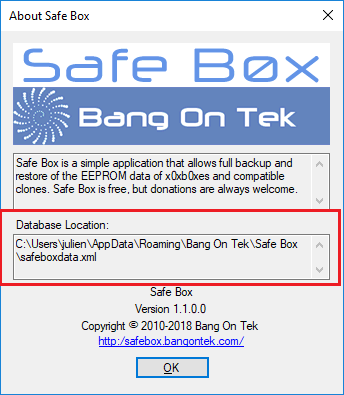 The About box now displays the path to the SafeBox database file. Also the source code is available for download. The beta version of K0ntr0l is now available for download. Safe Box is now obsolete. Looking forward to your feeback.